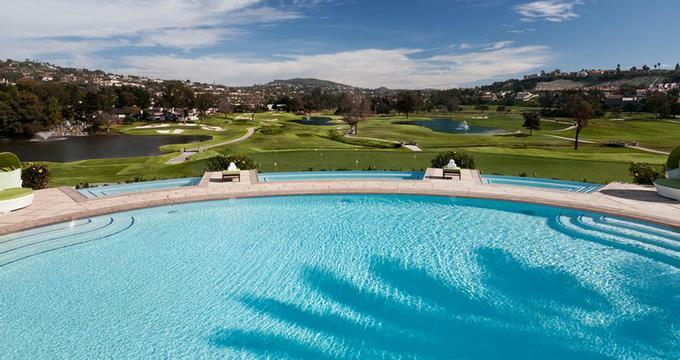 If you are looking for weekend getaways from San Diego or Los Angeles, La Costa is ideal for golf and spa enthusiasts. The resort is located near the Pacific Ocean, 30 minutes north of San Diego and 90 minutes south of Los Angeles. Get pampered at the full-service spa and play golf on two PGA Championship 18-hole courses. The recently renovated 43,000 square-foot wellness center features private VIP suites, a Roman waterfall, a tranquil outdoor courtyard and an array of luxurious treatments. Experience VIP treatments in a luxury VIP Spa Suite featuring two side-by-side massage tables, a fireplace and a patio with a private whirlpool. Many of us could probably do without the TV and the phone, but the private shower and bathroom is a great perk. The spa offers a choice of VIP treatments for two starting at $450 for two hours. You will each receive AGUA de la VIDA treatment followed by a 50-minute massage. After the massage, you will have one hour to relax in the suite. A bottle of champagne and Carlsbad strawberries with chocolate truffles complete the sensory experience. And in case you are curious, AGUA de la VIDA consists of a soothing roman whirlpool, cedar sauna, steam room and an exfoliating body scrub. Two PGA Championship courses excite golfers of all abilities. Golf lessons are provided at the La Costa Golf School, including private instruction or customized programs for couples or small groups, giving you a chance to improve your game. The resort frequently offers golf packages, especially in the off-season. If tennis is your game, here you can play on 19 courts featuring clay and hard courts surfaces, with seven courts lit for evening play. If you feel the need to improve your game, the Tennis School is renowned for the quality of its instructors. Choose from 611 recently renovated accommodations set on 400 landscaped acres. Choose from deluxe rooms and one-, two- and three-bedroom suites. Choose from a number of dining options, including the Spa Cafe serving light healthy meals, BlueFire Grill which offers delicious options from the grill, and Legends California Bistro serving Californian cuisine. Carlsbad is known for its fun beaches, quaint downtown village, Legoland California, and the Flower Fields. 50 acres of blooming Giant Tecolote Ranunculus flowers attract over 150,000 visitors between mid-March to early May. The city of San Diego is just 15 miles to the south. Visit the San Diego Wild Animal Park, the San Diego Zoo or the SeaWorld Adventure Park. Get married at a luxury resort in Southern California where you will have a choice of wedding venues and access to a team of expert planners. The hotel can accommodate events of up to 900 guests. Tie the knot with a view of the golf course either at Valley Promenade or on Legends Lawn. Orchid Terrace is another romantic outdoor venue. The resort has a lush Courtyard which can hold weddings of up to 300 guests. Indoor venues include the 900-guest Costa Del Sol, Poinsettia Ballroom and Orchid Terrace. Expert event planners can help you plan the ceremony of your dreams. They can recommend top photographers, musicians and other experts in the area. Elegant rehersal dinners can be held in a variety of banquet rooms. Ask about group rates and special perks for the new couple. Plan to spend some time at the resort's beautiful spa to get ready for the big day. Temperature in the mild Southern Californian climate ranges from an average of 58 degrees in January to 73 degrees in July. Rates start at $270 per night, depending on season and availability.